SWEET NOVEMBER! It's Release Day! Hi all! We have JUST the cure for your trick-or-treating hangover today at The Greeting Farm! It's November 1st, and the gorgeous images you've seen for the past few days are now available in the TGF STORE! We are happy to be adding My Heart, Frou Frou Sweet, and the adorable Oliver/Amelia Valentine to our line of lovable, versatile TGF characters. Here is my card using the My Heart kit. Nothing fancy on this card, just plain ol' stamping and doodling. I love drawing on my cards, it makes me feel like an artiste =) I drew the word bubble, the mini hearts and the striped border outside of the pattern paper. I used three elements from the My Heart kit: the sentiment "imagine the POSSIBILITIES, the girl, the hearts on the dress. For the final touch, I added some Star Dust Stickles on all the heart images. I know this card is a complete opposite of the cards I made yesterday but I like to switch it up sometimes. Hope you are enjoying all the creations for this preview. Today as always, there's a chance to WIN the whole release collection! Be sure to check out the TGF BLOG, too, not only for our hop, but to see who's "ALTER EGO" won the contest! I was definitely blown away with all the submissions. We're excited and can't wait to get started, so just head on over and let the fun begin! back to the TGF Blog to let us know you are done! Hi guys! HAPPY HALLOWEEN!! This is Day Three of the November Previews. Today's preview is featuring OA - Valentine. Yay! I just love Oliver and Amelia, they are one cute pair! This set is freakin' adorable. Here is my first card featuring Amelia in her cutesy outfit. 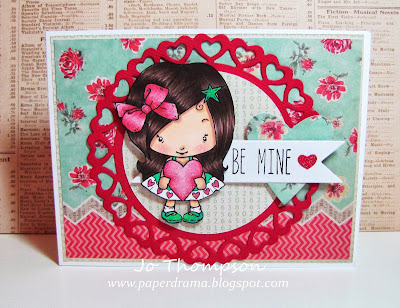 One of the sentiments in the set is "Be Mine". For my second card, here is Oliver! 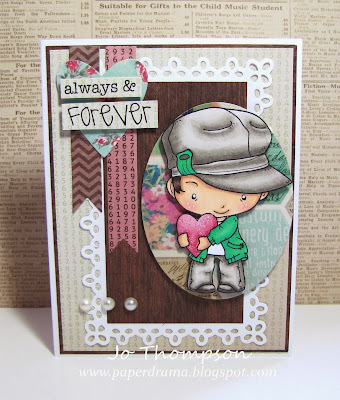 Another sentiment from this set is "always & FOREVER". This set is great for Valentine's Day and if you just want to be lovey dovey =). Stay tuned for tomorrow's November Release Blog Hop where you can win all three new releases, but if you want to win this set today, go head on over to the TGF Blog and comment to enter to win! Have a safe and FUNtastic Halloween! Hi everyone, I hope you are having a happy Wednesday! I just wanted to share this card I made using the Gorjuss Stamp - You Brought Me Love. It is my entry for the 7kidscollegefund DT Call. Isn't she adorable? The stamped image does have a small scene in her background but I opted to cut it out. I just wanted her to be the main focus, also she is colored with my Copic markers. I used the fishtail part of an MFT Awards Ribbon Die for the "...simply gorjuss" sentiment that is included in the stamp set. I only have one doliy die, but I was able to purchase a set of the beautiful doilies from Dovecraft. For my embellishments, I used some flatback pearls and I Am Roses flowers. I tied a little lace bow to match the ribbons in the hair. So that is my card. I hope that you like it. As always, thanks for stopping by and I'll see you tomorrow for another blog post from me! Hi Guys! Welcome to our Day 2 of our fun announcement! After a lot of requests to bring back special contests such as "Rockin Rebel", The Greeting Farm has a few FUN announcements to make today! First of all, beginning in November, we will be discontinuing the Retro Fresh Challenge and also the GVT, but have no fear, a new FUN contest will take place quarterly, such as the one we are about to announce today. In addition, we will be continuing the Farm Fresh Friday Challenges, so there will still be plenty of fun on the Farm! We are also excited to announce another customer-wide blog hop opportunity for the holidays, so be sure to stay tuned for info on that right after the November release! How fun is this going to be? We know that there a lot of you creative peeps out there who do amazing things with our line of stamps, and sometimes you like to kick it up a notch or two by switching heads, bodies, clothes, etc. Well with Halloween coming up, we thought it was the perfect time for a contest, so here's your chance to do it to WIN a prize! 1.) You MUST at least use two (2) TGF stamps to create your character. 2.) You must create a NEW project. 3.) You can create a card, altered project, whatever you'd like. The INLINKZ will open TODAY (10/24). You have until 10/31 (Halloween!) to create your "Alter Ego". Winner will be announced on RELEASE DAY, November 1st! 1.) Winner will receive their choice of two (2) 4x6 stamp sets AND a GUEST DESIGNER SPOT at The Greeting Farm! We are changing the way we do our Guest Designer as of this coming month, in the hopes that we can give even more talented peeps to showcase their work. Guest Spots will no incorporate 1-2 features a month on the TGF Blog and give LOTS of creative freedom to the designer, so believe me, you'll want to show us what you've got! InLinkz will open October 24th on the 2nd ALTER EGO post at the TGF Blog. All contest submissions should be uploaded by October 31st 11pm CST. Have TONS of fun with this...we can't wait to see who YOUR "Alter Ego" will be! I used Flirty Anya (Head) and Fleur Anya (Body). Hello everyone! Garden Variety Tuesday is up at The Greeting Farm. The theme is, can you guess, it's Halloween. I brought out an oldie but goodie from my TGF stash, Lolli Anya. Some of you might have been able to get her when she was re-released on a Farmer's Market Sale on the TGF Website. I love her! Here is my card. I just used one pattern paper that totally matched her lollipop. She is colored with my Copics and accented with Orange Peel and Star Dust Stickles. I used chalk for her blush instead of a Copic color. This technique was inspired by fellow DT Member Rosie, you can see her blog post here. This is my fourth Halloween themed card this month and there is still plenty of days left to create more before the big day! 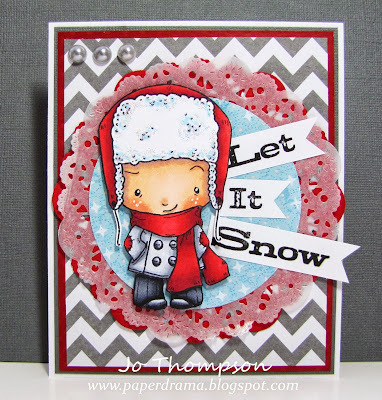 I hope you enter your creations for this GVT challenge over at the TGF Blog. Have fun! FFF - No Cards Allowed! I decorated this mason jar mug from the .99 Store. I have several of these to alter and that's what I did. I kept the decorations simple. The image I used is Limited Edition Queen Bean, she was part of the Alice in Wonderland collection. She is colored with my Copics and I glittered her crown, hearts and outfit with Stickles. I also drew a red heart on her face to make her more festive. The large hearts were cut from glitter paper using the Film & Polaroid Die Set. I used the same paper with a small heart punch. The black label wrapped around the jar was cut from the Tim Holtz Styled Labels die. I drew a border with my white gel pen to make the label pop out. For the goodies in the jar, I wrapped them with black tulle. I painted a skewer stick with black acrylic paint and added some glittered die cut hearts. 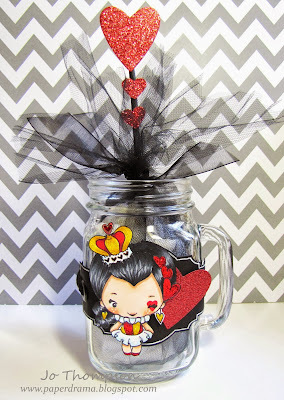 This treat jar can be used for a Wonderland/Halloween party. So that's my project for you guys today. Head on over to the TGF Blog to check out the other creations from our Designers. Thanks for stopping by, have a fabulous weekend! GVT - Hat's Where It's At! Hey guys! Happy Tuesday! It's time to play the Garden Variety Tuesday Challenge over at The Greeting Farm. The theme is "Hats"! Go through your TGF stash and find an image with a hat. There are plenty to choose from. Here is my card using OA Fuzzy Wuzzy. He's soo cute in his cozy hat, all bundled up. I went with a winter theme and I chose red/grey and a baby blue as my color palette. I still have a ton leftover of chevron paper from my sister's wedding and I need to use it. Oliver is colored with my Copics and I added some Star Dust Stickles on his fuzzy hat. I used my favorite and only doily die from Cheery Lynn on some red cardstock and wax paper (easier to peel off from the die than vellum). 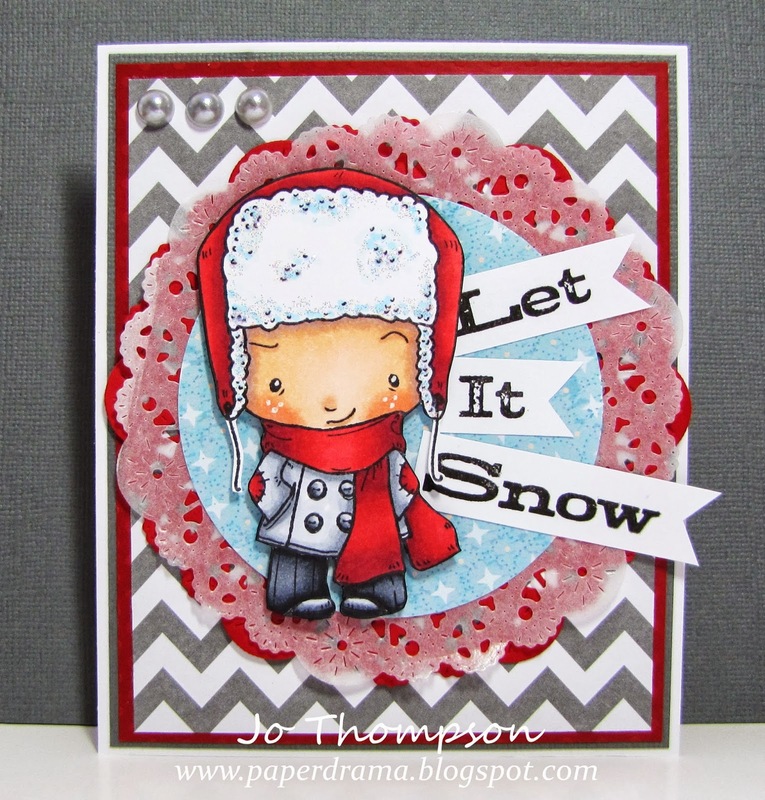 The sentiment "Let It Snow" is from Hero Arts. Lastly, I added some silver flat back pearls on the top corner. Go get your TGF hat image and play along with us on this challenge over at the TGF Blog and GOOD LUCK!! Happy Friday! It's Farm Fresh Friday time over at The Greeting Farm. Today's theme is "Masculine". 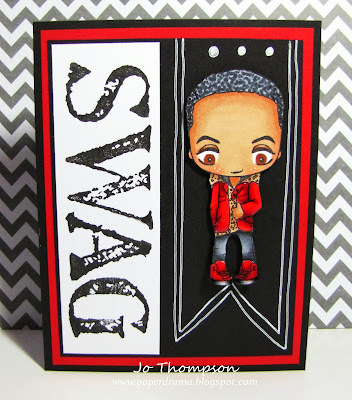 I am using the adorable CC Dante. He is soo full of SWAG (that's slang for really cool)! I didn't have that sentiment so I just spelled it out with my alpha stamps. He is colored with my Copics. Just look at him, red leather jacket, red kicks (shoes), and yes I gave him a cheetah print hoodie! LOL. He is just sweatin' pure swagger, hahaha. For a cheetah/leopard print Copic tutorial, you can watch my old video here. I added some Glossy Accents to his jacket and shoes, I didn't think glitter was cool enough. I had fun with this theme and this stamp was perfect! Come join us over at the TGF Blog! Here is my card using Beanie Anya (retired). I was able to pick her up from last month's Farmer's Market Sale over at The Greeting Farm. She is colored with my Copics and also paper pieced. I added some poinsettia die cuts with green flat back pearl centers. I also added some to her beanie. I haven't bought any new holiday papers yet this year, I just pulled from my stash. It's never too early to start making Christmas cards. I know Halloween hasn't even passed yet, but if you are ready to start your cards for December, why not enter them in this challenge over at the TGF Blog (just make sure you use a TGF image). Okay TTYL! Have a beautiful week! Happy Farm Fresh Friday over at The Greeting Farm! Today's challenge is to create a tag. 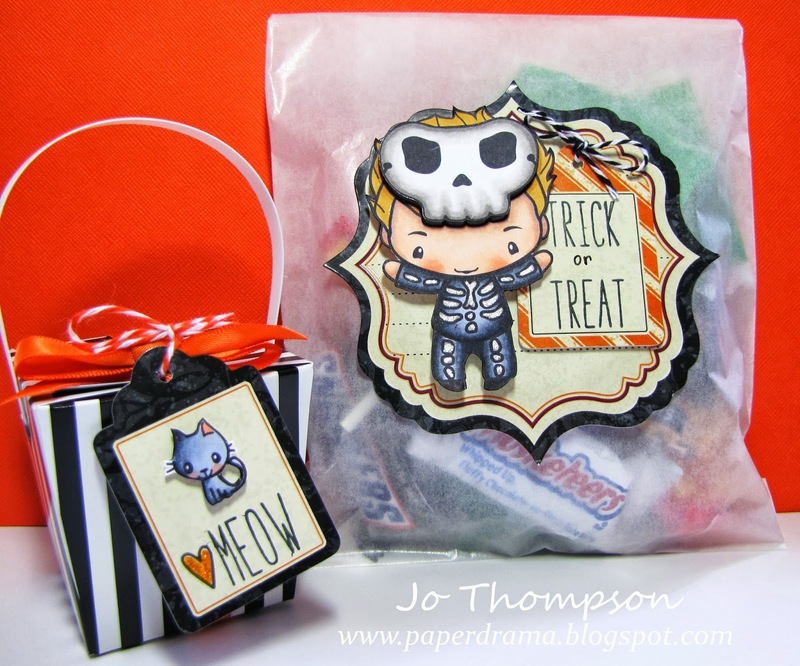 I decorated a glassine bag and added a little tag to a treat box. The first started with the image Digi Hallo Skeleton. He is colored with my Copics and I colored a second mask image and added dimension with pop dots. I added some sparkle with a gelly pen from Sakura. 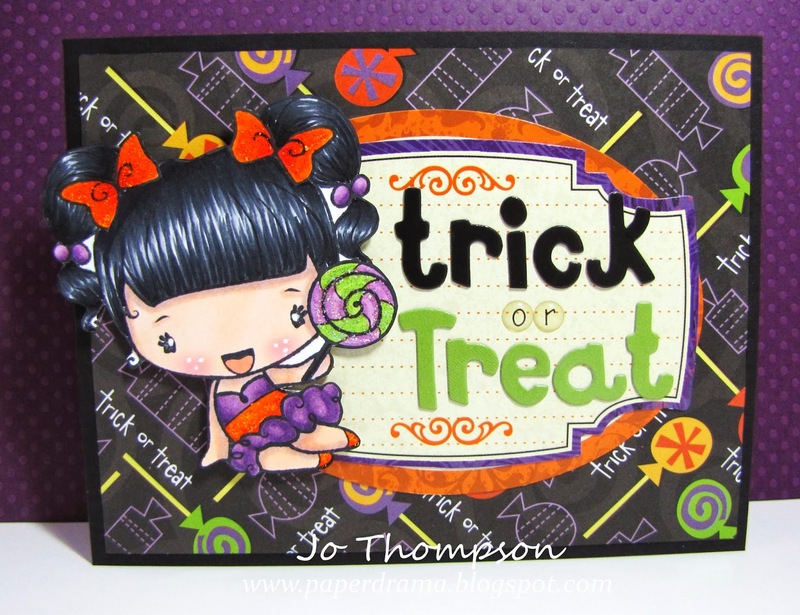 I layered a mini tag over the large bracket tag then stamped the sentiment "Trick or Treat". The tag is attached to the front of the glassine bag and it is filled with yummy candies for my hubby. To accompany the treat bag, I have this mini treat box. I used this box on a previous project and I had extras. The cute cat is from the Digi Hallobean. I didn't use the witch that came with the set, just the cat. I stamped out a heart and MEOW on the tag. Simple and cute =) This too is filled with candy, maybe I should pop in some dental floss with all these sugar goodies LOL. That's my project for you guys. Head on over to the TGF Blog to play along with us. You should be arriving from Ivett's Blog, if not that's okay. The Blog Hop list is below so that you can make sure to comment on all the blogs for your chance to win some I Am Roses flowers. Today I altered some Mini Takeout Treat Boxes. I bought a pack of these boxes from my local Michael's in their dollar-fifty bins. I thought they would be perfect because they had black and white stripes. I cut some images from Halloween designer paper and placed them in the front, perfect fit! I had some old tags in my stash and I just decorated them with twine, goodly eyes and some stamped images. The I Am Roses leaves and flowers were only adhered to one flap. I layered one colored leaf, a 3/4" rose and a 1 1/2" flower together. The opening flaps are not glued or tied shut. To keep the treat box closed and secure, I wrapped some orange baker's twine around the box twice and through a hole on the tags. Things are so much easier when you don't have to construct the actual treat box and all you have to do is decorate them. Easy peasy for any party where you have to make multiples. So that's my project share for you guys today, you can view my video here. I hope you have fun visiting all the creations made by the IAR Design Team.